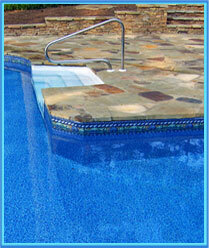 Vinyl liners are an essential part of many swimming pools. Most pool liners will last anywhere from 8 to 10 years depending on several factors. If your swimming pool liner is looking bad and needs replacement, you should call Harmons Pool and Spa Repair of Springfield, Mo. immediately to find out how you can protect your swimming pool investment and save money. 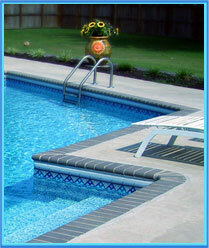 Pool liners provide durability, convenience, value, comfort, and are available in several beautiful styles. As installers of vinyl liners and pool liner replacement, we customize every vinyl liner by using CAD computer software to fit your swimming pool. Harmons guarantees quality products because our virgin vinyl pool liners are treated to resist UV fading and withstand temperature changes. Vinyl liners will lower the time you spend on maintenance because they are exceptionally easy to clean. Algae have a hard time sticking to vinyl liners due to their smooth surface. Colored vinyl will not require you to paint the swimming pool every season! 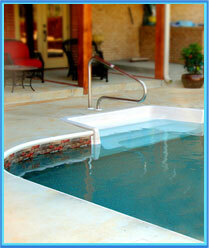 Installing our pool liner will give your pool a whole new look, it will be like having a new swimming pool!